I am here describing all the packages for the families of Govt Employees who die during service. These packages are vide the Establishment Division Office Memorandum No. 7/40/2005-E.2 dated 13-06-2006, 30-12-2006, 21-10-2006, 01-08-2007, 15-03-2008, PM Secretariat (Public) U.O No. 42/GS/Estab/2006 dated 16-10-2006, No. 8/1/2011-E.2 dated 3rd November 2011 & 8/20011-E.2 dated 15th March 2012. Lump Sum amount as mentioned below will be paid to the spouse of a married employee and to the surviving parents if the employee was unmarried. Lump Sum amount for security related deaths as mentioned below will be paid to the spouse of a married employee and to the surviving parents if the employee was unmarried. A sum of Rs. 500,000/- will also be paid to the officials/officers incapacitated and released from service for having become invalid as a result of injury in encounters/bomb blasts, riots/ watch and ward duty or terrorist activity. A sum of Rs. 300,000/- will be paid to the officers/officials incapacitated as a result of the injury in accidents as stated in above para but they are still serving in the department. 75% Pension to the spouse or the eldest till the youngest child attains the age of 18. Normal Pension will be paid to the spouse after that for life. In case of security related death full pension will be granted to the youngest son till the youngest son attains the age of 18. Normal pension will be paid to the spouse after that for life. Retention of Govt house or payment of rent for hired house for 5 years or till the age of superannuation which ever is earlier but for a minimum period of 3 years. In case the Govt employee who died had neither Govt accommodation nor rented house at the time of his/her death, his/her family will be entitled to draw House Rent Allowance drawn by him/her at the time of his/her death for the above stated period. 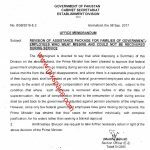 Retention of Govt house or payment of rent for hired house on payment till superannuation or 5 years which ever is later. Second condition is the same as the non-security related death 2nd condition. 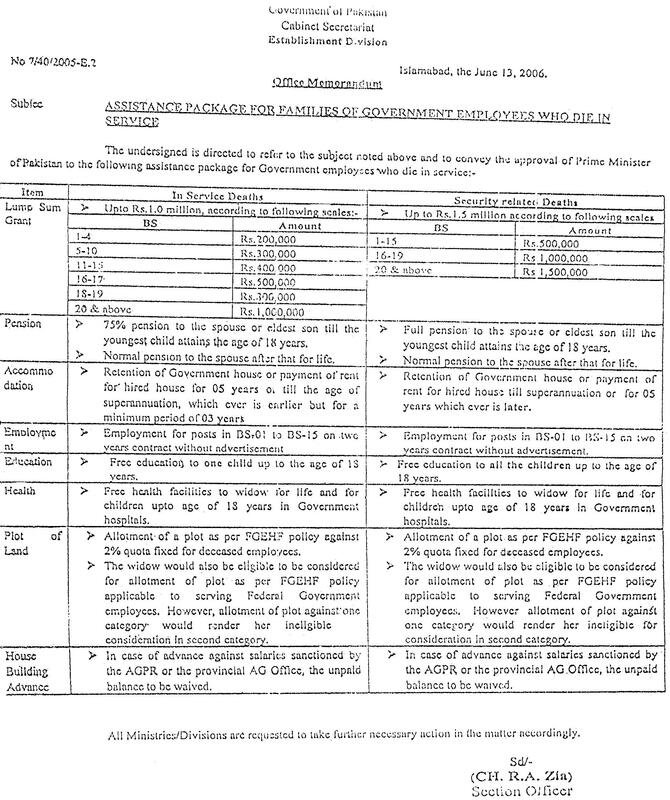 Employment for the posts of BPS-01 to BPS-15 on contract basis for a period of two years without advertisement will be granted by the department to one child or widow/widower of a deceased employee. Free education up to the age of 18 will be granted to one child in case of non-security related death and for all children in case of security related death. Free health facilities will be provided in Govt Hospitals to the widow and one child till the age of 18 years in case of non-security related death and to the widow and all children till the age of 18 years in case of security related death. The unpaid balance amount House Building Advance, Motor Car Advance, Motor Cycle Advance & Bi-Cycle Advance will be waived off for both the categories. Free Education up to the level of Graduation level has also been provided to the children of Shuhada’s in war against terrorism of the Armed Forces, Civil Armed Forces, Police & the Intelligence Agencies vide PM Secretariat (Public) Islamabad U.O Note No. 1 (1)/DS(IA-III)/2012 (1166) dated 02-07-2012. There are also some other assistant facilities of allotment of plot by FGEHF and waiving off the unpaid amount of plot allotted by FGEHF at various conditions. kindly ya letters mila to sent kejia ga. Thanks a lot for posting the notification for the public benefit. I am looking for specific reference of 2002. My father was a high school teacher (BPS 14) and he died in May 2002 in service. I would like to know that if this notification is effective for the year 2002. If this is effective can my sister (she wanna apply) apply for BPS 1-15 job, if she qualifies the requirements? I can provided further information in case one is interested in helping me. If there is any one who can guide me this regards please contact me on the following email or whatsapp me on the below given number. I can pay the case fee and other expenses for the case. I shall be grateful to you for the help. My father died in a bomb blast in the year 2007 while he was in service in FATA Secretariat. Please confirm whether my mother (Widow of deceased employee) was entitle for allotment of plot as per earlier notification issued by the government in the year 2006; if so, please advice me proper channel to approach for the purpose. Whether House Rent Allowance admissible to the family of a deceased Under the existing package or otherwise ? AoA, could anyone tell the effective date of the above provided notification? is it effective from the day it is dated with and if so was there any assistance package prior to this one? i mean for employees who died before 13-06-2006.
please give detail about who die in 2005 in svc in security forces. bhai jan kia ye notification Government of Sindh Employees k liye b Follow hoga ya sirf Federal walo k liye ye notification? Dear Waseem I think KPK will issue the same Notification soon. 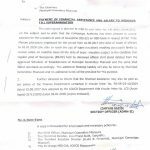 My Father was on medical leave from last six months and apply for retire through medical board. but on 30 Oct 2014 he died. now please tell me can they will avail the grant according to revised notification issued by PM on 20 Oct 2014, for in service death of Govt. employee? 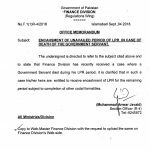 Also tell plz this notification issued only for federal Govt? or apply over all pakistan Govt. employees? 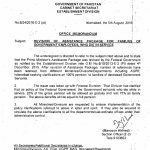 Dear Rizwan it is still only for the FG Employees. Umeed hay Subai Govt will also issue the Notification. Agar Notification of Retirement jaari nahin hua aour Medical Board nahi hua to aap is category main aatay hain. Dear Taimoor, after the issuance of this letter there are chances of regularization of u.
I m Abdullah khan (LDC PAK Customs) from kohat and my father namely Riaz Khan (Havaldar) was in Pakistan Customs and he died on 01.01.2013. i send my father Benevolent Fund Case to FBR Islamabad on 24.06.2014 and till date i didn't receive any reply from FBR Islamabad i simply want to know that how much time it will take. Dear Abdullah Khan, some times it takes months. You should just send a reminder in this xase. Can you please explain the difference between "in service death" and "Security Related Deaths" ???? My brother died in a terrorist bomb blast in peshawar last year. We applied for the package of "Security Related Deaths" but they refused it and give us "In service Deaths" package. My brother was a federal employee and rendered 29 years regular service in TDAP. He was on duty when this bomb blast happend. Dear Naeem Jan Security Related Death means the Employee on Duty of Security Purpose eg. Policeman, Army man, Rangers etc. Aoa, i just wanted to ask this, my father was a government servant who served his country for more than 18 years in service and he died while on service. We (his children) are currently enrolled in different universities and schools and we never got any funds except for gratuity and a pension of Rs. 10,000/- per month (which is frankly nothing). My father was a 17 scale officer who worked in MDA (Multan Development Authority) Pakistan as a Assistant Director Urban and Town Planner. We never got any sort of BF everybody talks about nor any sort of compensation for all his devoted works. Is it fair? We are currently going through a very tough phase where sometimes i can't even pay my fee for education. Dear Saad when the death of your father occurred. That My Father Late Manzoor Ahmed Qureshi,who was serving in Finance Department as a Treasury Officer Nawabshah and died on-07-08-2001 in a road accident during his service period. 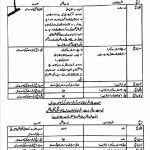 That, I have also sent my application Through District Accounts Officer Nawabshah which is submitted to Section Officer (Treasuries) Government of Sindh Finance & Co-Operation Department Karachi Diary No.587 Dated 16-01-2004. That I have again submitted my request on dated:13-09-2013 to your kind Honor for favorable consideration Necessary action on my genuine request, Chief Minister Sindh,has issued directives to Secretary Finance Department Government of sindh Karachi Vide.No.SO(IMP-III)/CMS/4(67)R.S 2013/1297 Dated:15th September 2013 Chief Ministers’ Secretariat, sindh Karachi through additional Secretary (Imp & Dev) Muhammad Anwar-ul Haq under intimated to your kind honor. I am ALMAS MALIK (Age-22) is employee of Federal Directorate of Education. My father died dated 22-March-2011. 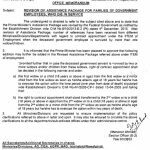 My appointment is under prime minister assistant package for the period of 2-years. my date of joining is 25-Feb-2013. Now i s need of my family, please guide me how i can convert this contract job into permanent. is there any legal way ????? Dear Almas Malik, Allah say dua karo Insha Allah department aap ko regular kar day ga. FGEIs nain to 2 saal baad contract base per (Death Related Cases) regularized kar diay thay. I am Amir Sohail mea bohat uddas hun Madam q k mary 02 bahi hai or 03 behnay hai sab se bara mea hun. May bohat mehnat wala hun. mea ne DAE (electrical) Kiya hai or saat me computer Diploma kiya hai web designing bi kiya hai, meri Experience be hai Computer Operator or Dispatch Rider be hun. mea kiya karu ap muje batoa mea bohat pershan hun meri salary 10000 hai. Mea Bank mea temporary kam karta hun. Dear Amir Sohail, Allah per bhrosa karo aour mayoosi chor do. Allah say dua karo. In Sha Allah, aap kay haq main better hoga. working person. Madam my family is so worried. My Father namely Noor Ullah Khan (Customs Sepoy) S/O Fazal Rahim R/O Village Speena Banda Tehsil and District Karak while in Government vehicle on duty during at chasing of fleeing one non-duty-paid vehicle at Indus High way (Kohat) – Kohat Peshawar Road met an accident causing tyres blast resultantly, my Father and two Sepoys expired and embraced Shahadat on the spot and one Sepoy namely Shahkeel Ahmed save fortunately, the Inspector Mr. Muhammad Saeed Khan completely disable from the legs in the year of 2002 . At the death of my Shaheed Father, the following my Brother & Sister are leaved clangor world at the time of deprivation flower Be House. At the time of death of my Father, service was 9 and 6 Month year. Dear Awan, the pic you see there at this post is the copy of the notification. does it also apply for govt employees working on contract basis? if BF and Group Insurance are deducted from monthly bills then i think it is also applicable to contract employees. Thanks a lot sister for arranging such a beautiful and beneficial information for all govt servants who due to ignorance were deprived off from their rights. May Allah bless you for this noble cause. Dear Asim Thanks for appreciating mine efforts. mera beta railway employee tha wo unmarried tha 13_3_2014 men us ke death ho gaye us pm package banta he ?